Climb into the cab of the huge grinder/crusher and start mining! Shift the grinder along the side of the mine and uncover gold nuggets. Hop into the small front loader and scoop up the chunks on the ground, then haul them over to the scientist’s mobile lab. Be careful, the demolition expert is about to set off the dynamite to search for more nuggets. Load up the mining carts and empty them in the waiting dump truck for processing. Wait, what's that? You woke up a bear and it's coming to check out your lunch! 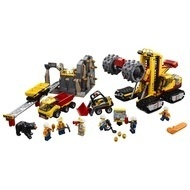 - Includes 6 minifigures: 2 drivers, a demolition expert, miner, scientist and a chief, plus bear and spider figures. 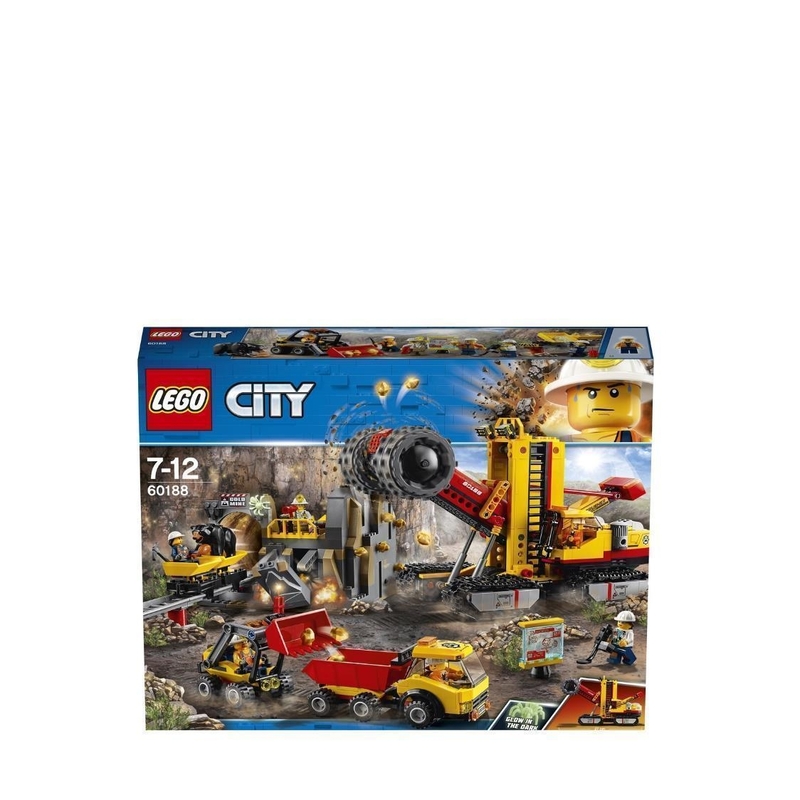 - Features a massive grinder/crusher with minifigure cab and raising arm, plus a small front loader with raising shovel and a dump truck with tilting bed. - Also includes a large mine with breakaway elements to reveal a hidden golden nugget, a turning chute, track system with 2 mine carts, and a mobile lab. - Spider glows in the dark! - Turn the knob on the side of the grinder/crusher to spin the drill wheel. - Raise the grinder/crusher arm to lift or lower the drill wheel along the side of the mine. - Drop nuggets down the chute into the mine cart, then empty the cart’s load into the dump truck’s bed. - Dump the golden nuggets out of the truck bed and use the front loader to haul them to the mobile lab, before you use the triggers to blow open the hidden cache in the mine. - Accessory elements include a dynamite stick element, pickaxe, megaphone, chicken leg and 12 golden nugget elements. 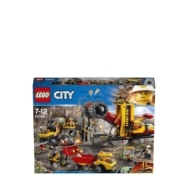 - This children's toy is suitable for ages 7-12. - Grinder/crusher measures over 6” (17cm) high, 11” (28cm) long and 4” (14cm) wide. - Front loader measures over 2” (6cm) high, 3” (10cm) long and 1” (5cm) wide. - Dump truck measures over 2” (6cm) high, 4” (12cm) long and 1” (5cm) wide. - Mine carts each measure over 1” (3cm) high, 1” (4cm) long and 1” (3cm) wide. - Mine with track measures over 4” (12cm) high, 5” (15cm) wide and 14” (37cm) deep. - Mobile lab measures over 1” (4cm) high, 1” (3cm) wide and under 1” (1cm) deep.